The 1960s and 1970s were a major period of road building in the United States. Interstate highways were constructed, major arterial highways were improved, and new roads were developed to provide access to vast, undeveloped lands. With these improvements more commercial development appeared outside of urban and village centers, particularly along major highways and at interchanges. With time, vacant lands between the commercial uses filled in. Individual curb cuts for each business lined the highway. Traffic increased. Congestion began to cause delays for drivers. People found it difficult to enter or leave businesses or homes along the road. The number of accidents grew. State and local officials widened roads to handle more cars. Before long there were traffic signals, left turn lanes, and four, six, and even eight travel lanes. What can be done to break this cycle of increased congestion necessitating costly road widenings which result in increased traffic? While there is no single solution, one important - and increasingly used - strategy involves what is called "access management." 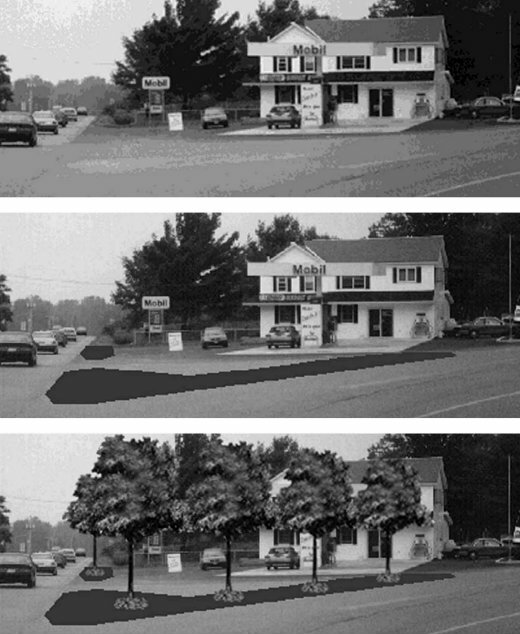 Impact of reducing excessive curb cuts at a corner location.